How to edit the subtitle/tagline in mobile Wikipedia? In mobile version of Wikipedia, some articles have a subtitle AKA tagline. 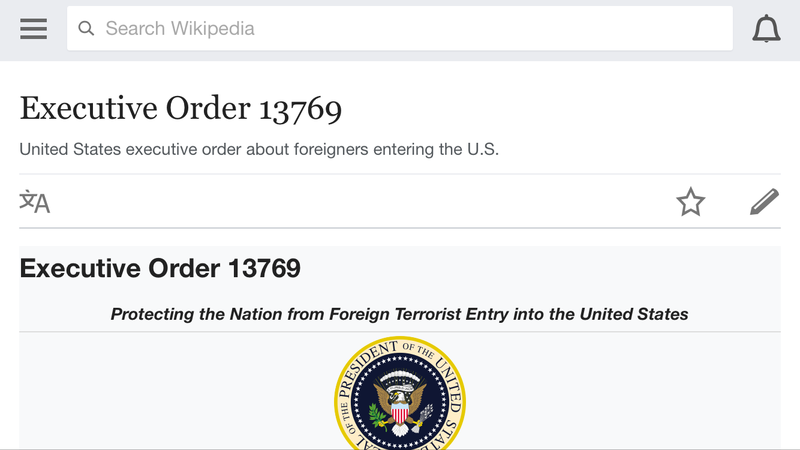 For example, in the article about Executive Order 13769 it says "United States executive order about foreigners entering the U.S."
The problem is, I can't find how to edit it. The text it contains cannot be found in the page source. That's the description field from Wikidata, a sister site of Wikipedia that stores information about articles in structured data that can be used easily by machines. That article's Wikidata item is Q28543928. The link for any Wikipedia article can be found by clicking "Wikidata item" on the left-side toolbar in desktop view, but I don't see the link on the mobile version. Not the answer you're looking for? Browse other questions tagged wikipedia or ask your own question. Is it possible for a normal user to flag a Wikipedia edit as potential vandalism? How do you end a subsection in MediaWiki? How do I edit Wikipedia's top right infobox? Why Wikipedia doesn't allow cross-linking? How can I permanently disable the mobile version of Wikipedia on mobile devices? How to edit software repository in an infobox on Wikipedia? What are the different “classes” for Wikipedia biography articles and what do they mean?